The Horizon GS1040T treadmill has plenty of cool features to keep you occupied as well as entertained and motivated during your daily workouts. 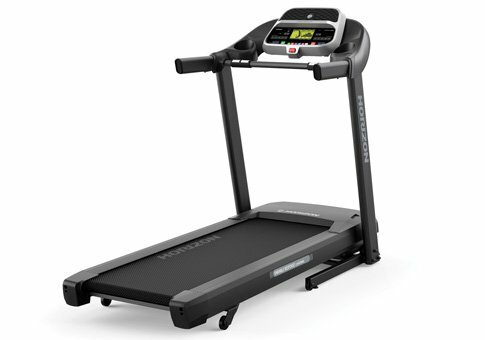 With an adjustable 10% incline, flex cushioning, and 16 programs, it is one of the best in the budget class of treadmills from Horizon Fitness. UPDATE: The Horizon GS1040T treadmill is no longer being manufactured or sold. Take a look at the latest available models to find a comparable model that's right for you.. Experts feel the strengths outweigh the weaknesses in the Horizon GS1040T treadmill, and determine it to be a good buy at this price. If has a durable 2-ply belt (1.6mm thickness) rolling over a 20" x 55" deck equipped with FLEXzone™ adjustable cushioning that lets you pick your surface choice from soft to hard. The Horizon GS1040T even includes a weekly goal center so can plan your workouts accordingly as you focus on dropping weight and getting your daily cardio done. Owners of the Horizon GS1040T appreciate the low noise level that allows them to watch TV or have a conversation without being annoyed by a whining treadmill motor. Other pluses they cite include the cushioned deck and the fold away design. 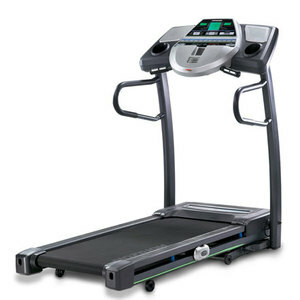 As for the one-year warranty, it’s short but average for a Horizon treadmill. Reviewers recommend you opt for the extended warranty. With a suggested 300-lb user weight limit, it might prove to be a bit light for a very large user, or someone who plans to do serious running on a machine. Other than that, consumers feel it is an excellent value at this price. At $899, the Horizon GS1040T is one of the best budget treadmills we have seen, and we feel it is capable of giving you years of good use. It is rugged enough for some light jogging and offers users the basics of what they need to start exercising, as well as staying motivated on a treadmill. Along with the nice variety of workout programs, the incline, a decent motor, and the foldaway design, you will also appreciate the extra comfort the deck cushioning provides to help minimize stress on the joints. We rate the Horizon GS1040T treadmill a good buy.